The executive in organization is in…four major realities over which he has essentially no control. The executive’s time tends to belong to everybody else. Executives are forced to keep on ‘operating’ unless they take positive action to change the reality in which they live and work. Finally, the executive is within an organization. Effective executives finally make effective decisions. 3 What Can I Contribute? How do effective executives staff for strength without stumbling into the opposite trap of building jobs to suit personality? They do not start out with the assumption that jobs are created by nature or by God. They know that they have been designed by highly fallible men. The second rule for staffing from strength is to make each job demanding and big. It should have challenge to bring out whatever strength a man may have. Effective executives know that they have to start with what a man can do rather than with what a job requires. … For a superior to focus on weakness, as our appraisals require him to do, destroys the integrity of his relationship with his subordinates. (80) …By themselves character and integrity do not accomplish anything. But their absence faults everything else. aim high, aim for something that will make a difference, rather than for something that is ‘safe’ and easy to do. the ‘feedback’ which tests the validity and effectiveness of the decision against the actual course of events. The first step toward effectiveness is a procedure: recording where the time goes. The next step, however, in which the executive is asked to focus his work on outward contribution advances from the procedural to the conceptual, from mechanics to analysis, and from efficiencies to concern with results. The chapter First Things First serves as antiphon to the earlier chapter, Know Thy Time. The effective decision, which the final chapters discuss, is concerned with rational action. There is a flurry of thoughts running through my soul after reading this book. There is the brilliant deconstruction of executive authority and power to service and ethics, there are the insights of empowerment regarding courage in light of analytic analysis, and there is the sheer simplicity of learning, prioritization, etc., that we all know, but have difficulty putting into practice. Drucker’s writings truly are a gift. Let us unwrap and engage diligently with its contents. It is worth our time and effort, and the world deserves to have all of us who are in positions of decision-making responsibility to be wise and diligent in these areas. My only negative evaluation of the book is that I had difficulty with the sole use of masculine pronouns, which may be understandable given Drucker’s era of writing. However, the necessity of recognition and acknowledgment of gender equality in areas of leadership and executive authority is a reality that we can no longer ignore. Perhaps if Drucker were writing in the 90s vs. the 60s, we would see more gender-inclusive language? I had one contention on page 93, in that Drucker says that the task is not to “change human beings.” I wholly disagree. I believe the results of effective decisions and effective leadership is exactly that, to change human beings, to transform them into something that they would not have become had it been left to their own devices. The global community, the efforts of love and grace, the goals of leadership, are to transform people into better people, to rid this world of more and more sin, and to imbue this world with greater value, greater humanity, and a greater presence of God. This is done by changing people, and leadership is the primary vehicle to make that happen. Prayerfully, more leaders, especially in service industries (justice ministries, non-profits, churches, youth work, etc.) 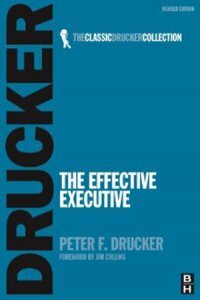 will learn from Drucker’s wisdom and insights, for there, the result that effective decisions produce is the immeasurable flourishing of the human spirit. These are results that our world must not live without. a website that delivers all the details i require.